Tab, Tab cola, what a beautiful drink! 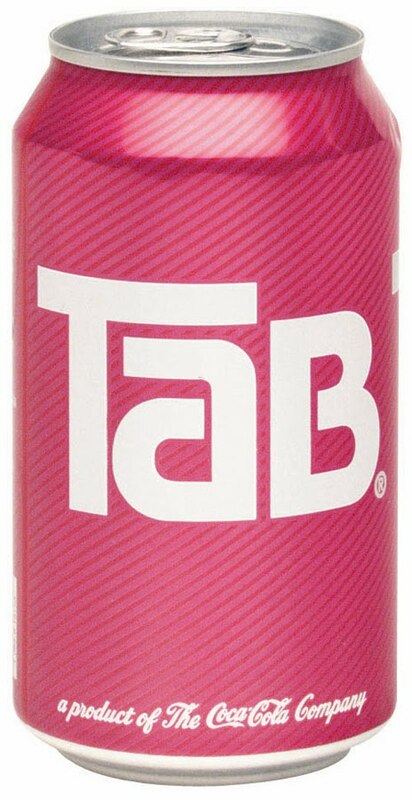 Tab, Tab cola for BEAU-tiful people, Tab! You're beautiful to me...twelve ounces and JUST one calorie, Tab! Man, Tab was a revelation back in the day. According to Wikipedia, it actually came out in 1963, which shocked me -- I thought for sure it was an early 1970s drink. For a while, everyone's mom bought it. We girls loved the pink can and the peppy commercials, and even before we knew what dieting was we knew it was some kind of great gift, what with the "JUST one calorie thing." Some fun facts from Wikipedia: There were lemon-lime and orange Tabs for a while. There was even Tab Clear. Diet Coke all but buried it, but it still stubbornly hangs on to its fans, and I always see it clutching a very small part of the pop shelf at my local grocery store. It's a total conversation piece if you buy it--the label and can looks just like it always has, and your retro-minded friends won't be able to stop talking about if if you have it at a party, even if they won't drink more than a sip. Because true facts here folks, Tab has a funky-weird taste. Not bad, but Diet Coke seems to have gone through a smoothing process that Tab just plain lacks. "(Tab) tastes like metal," says this one fan in a New Yorker article, and I would agree. I stumbled across Tab in a store maybe three years ago. The can is still that same shocking pink, but it was in a narrower can, about the shape of those tall, skinny Red Bull cans. Anyway, I had a sudden surge of nostalgia and bought one. The funky-awful taste was exactly the same as I remembered. Yuk.